Quickly quantify your total license consumption across hosts by vSphere Editions and Version. Learn where you have opportunities to upgrade both license and hardware to maximize your license investment or find opportunities to retire servers to allow for the reallocation of licenses. Summarizing and validating your vSphere Licenses across vCenters and data centers has never been easier. With today’s complex data center topologies and numerous vCenters, the ability to count, summarize, and correlate VMware vSphere license to hosts can be a daunting task. 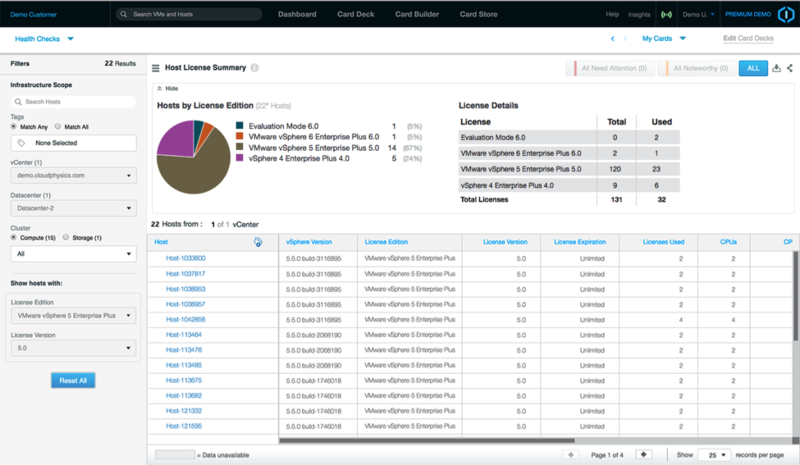 Find over-entitlement of licenses that may be deployed across multiple vCenters. Save the headache of unexpected expenses during your next VMware Enterprise License Agreement (ELA) renewal. The Host License Summary card can also quickly quantify the deployed license by hardware, number of VMs, number of physical CPUs, cores, and RAM. Using these metrics, you can identify inefficiencies in hardware that can be upgraded or replaced to maximize your license usage density. These same metrics can be used to identify hosts that should be retired and licenses that can be reclaimed and redeployed within the organization. Forget management headaches and unexpected costs. With just a few clicks, you can quantify license consumption by lines of business, geographies, or simple clusters. What once would have taken days of scripting and spreadsheet analysis can now be completed instantly, freeing you to focus on how you want to use your licenses—instead of just counting licenses. Gain insights in 15 minutes.